You can also cycle in autumn in beautiful places without shivering or having to wear gloves and heavy cycling clothing all the time. In fact, there is nothing better than a cycling holiday at this time of the year to take advantage of the mild temperatures Italy can offer. Incredible and unexpected destinations for cyclists from Lake Como to Piedmont. 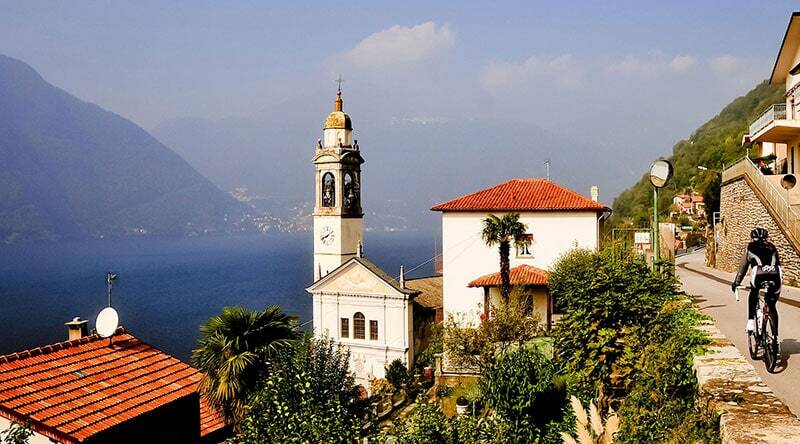 Stunning scenery, unspoilt nature from plains to mountains, the blue waters of the lake, green valleys covered with woodland and wild flower meadows, magnificent villas…for centuries, Lake Como never ceases to mesmerise with its nostalgic charm. Start your bike holiday here cycling around the lake, you will feel like you are by the sea when the lake starts to get wider at certain points. 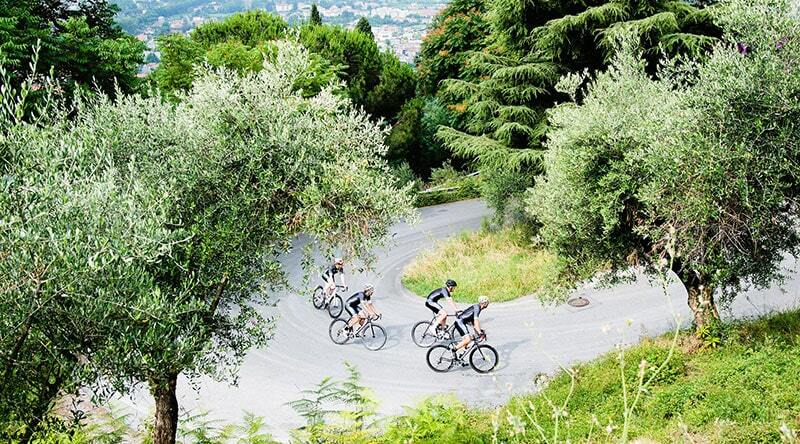 Continue your holiday climbing the Ghisallo pass famous for its church which is a real monument to International cycling. If you are looking for a place where the sun shines 300 days a year with mild temperatures then you have just found it. It is Liguria. This long and narrow land hides unimaginable paths with its continuous uphill and downhill stretches of varying length in its hinterland. Wherever you decide to ride, it is very common to find hairpin bends which provide views of rare beauty overlooking the blue Mediterranean sea. Here the climbs are not challenging like in other parts of Italy: Cipressa, Poggio and Testico are the most popular ascents. Time to take notes! It is a mountainous land. But also home to great cycling champions such as Costante Girardengo and Fausto Coppi to whom the largest European Museum of bike history and legendary riders is dedicated. With trails that wind through the lower valley up to the high alpine hills such as Moncenisio or the famous “colle delle finestre”, Piedmont has nothing to envy in comparison with the most famous Stelvio, Mortirolo or Gavia climbs. This is not all. 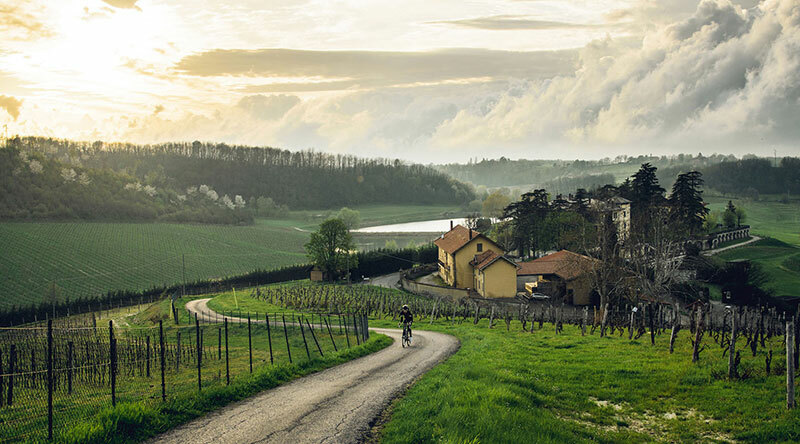 Piedmont is also famous and well known all over the world for its wine-growing areas of Langhe-Roero and Monferrato (UNESCO World Heritage site) for this, it offers easy to medium bike trails which are perfect for a relaxing ride when the temperature is mild. Several particulars of this destination are clearly evident in the changing of its landscape from calm sea to plains interrupted by rolling hills that quickly change into mountains. Like Mount Carpegna, the ascent where the pirate Marco Pantani trained for his victories or the ascent which takes you to the oldest republic in the world, San Marino. Many people think that the Dolomites belong only to Trentino, but they are mistaken. Most of this mountain range lies in Veneto between Vicenza, Verona and Trento. These are the first high mountains you see as you approach the Venetian plain, which is a good compromise for those who want to start gently on the flat and then tackle the most imposing 1,800-metre peaks. One of the routes that we recommend is the one that winds along the Valpolicella region and the area of upper Lessinia where you can also tackle the climb known among cyclists as the “time trial cannibal” Eddy Merckx. This destination is not popular for its climbs but for its many trails that wind through the hills surrounding the Eternal City. The streets are very quiet, the villages are testimony to the history of ancient civilisations, struggles, battles and invasions of all kinds. The first trail we suggest is the one that goes from Viterbo to Civita di Bagnoregio, “the dying town”: an ascent of 1557m spread out over 140 km. The scenery will leave you speechless even the most sceptical cyclists. 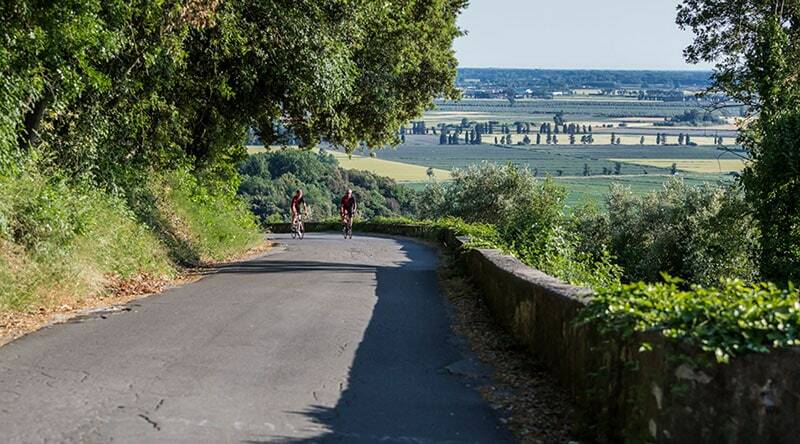 Among all the places we suggest you cycle, we could not leave Tuscany out. From September to October, the days are long and pleasant. Do not miss out on a ride to Val d’Orcia, a multi sensory trail in the land of Brunello (Montalcino) which will lead you to the oldest and most authentic cultural places steeped in history and traditions such as Bagno Vignoni and Pienza. 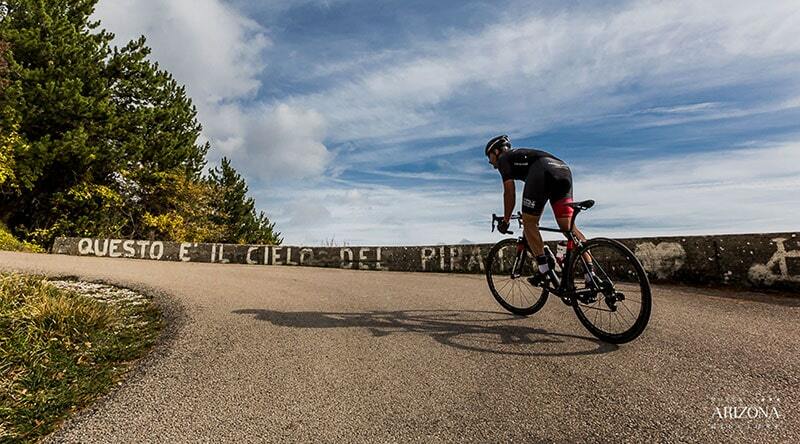 If instead you love ascents, the challenge is to climb up the Cipollaio pass in Versilia: the climb is 13 km long with a constant elevation gain.